Nokia is entering into the android world at last. Since a few years, Nokia was trying to make a positive impact on smartphone market but except its brand Lumia, others didn't create much buzz. Even after being acquired by Microsoft, its new venture with android would definitely make a positive buzz to reach out the smartphone users. News from leaked sources which reveal that the phone is rumored to be a replacement for the aging Asha range of phones running Nokia’s Series 40 software. 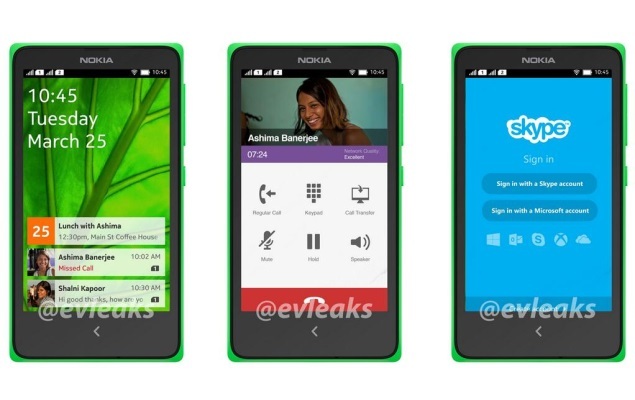 The codename is Normandy and known as Nokia X.
Nokia X has shown up on a benchmarking test website. It seems that the phone will be a modest performer in the market with similar featured phones. No proof found whether the benchmark results is fake or not. But the source of the initial images was seen on @evleaks Twitter account which came up with a list of specs for the new phone. If this news is true, this new smartphone may have a 4-inch touchscreen with a 480 x 800 pixel resolution, and be powered by a dual-core, 1GHz Snapdragon processor with 512MB of RAM. Considering this specs, we can't compare with Nokia’s high-end Lumia hardware, but it should be a competitive phone compared to other phones with android.